I was just watching this video on Mount Cody's, or make that (Rabbit) Cody's workout, and man he looks trim & fit! He will do good in the pros if he can maintain this (or even trim down a little more). Man, he moves fast for a big man. 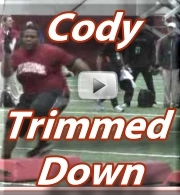 Check out the Mount Cody video for the NFL workouts below! Do you think he will make it in the pros? I do!